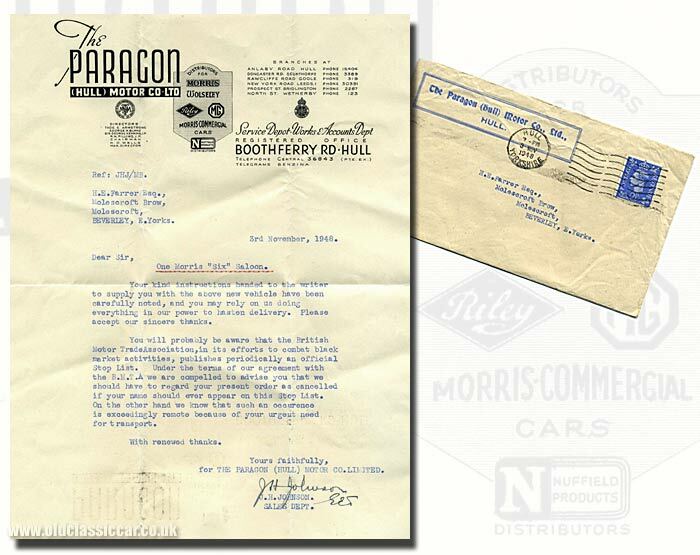 Letter regarding a Morris Six car by The Paragon (Hull) Motor Car Co.
Homepage. This page: A letter responding to a request for a new Morris motor-car, in the years following WW2. Supply of a Morris Six in 1948. "Your kind instructions handed to the writer to supply you with the above new vehicle have been carefully noted, and you may rely on us doing everything in our power to hasten delivery. Please accept our sincere thanks. You will probably be aware that the British Motor Trade Association, in its efforts to combat black market activities, publishes periodically an official Stop List. Under the terms of our agreement with the B.M.T.A. we are compelled to advise you that we should have to regard your present order as cancelled if your name should ever appear on this Stop List. On the other hand we know that such an occurence is exceedingly remote because of your urgent need for transport." Evidently it seems that there was enough of a problem after the war, with black market operators getting their hands on new cars, and presumably selling them for a price well over list price, to require the creation of the Stop List that they refer to. Find yourself on that list and the chances of getting your hands on a new car, already extremely remote, would become zero. Quite what Mr Farrer's urgent requirement for a car was it doesn't specify (a photo of a typical Morris Six can be seen here). As production of the Six only got into its stride in 1949, Mr Farrer was no doubt hoping to get onto the priority list for a time when the cars did begin to roll off the production lines at Cowley. Perhaps it caught his eye at that year's Earl's Court Motor Show, held the month before, where the Six made its debut. The Paragon Motor Company was a large organisation, with not only offices in Boothferry Road, Hull, but also in Anlaby Road, Doncaster Road (Scunthorpe), Rawcliffe Road (Goole), New York Road (Leeds), Prospect Stree (Bridlington) and North Street (Wetherby). Paragon specialised in the supply of vehicles from the Nuffield Organization, namely Morris, Wolseley, Riley, MG cars and Morris Commercials lorries and vans. There is a firm trading as Paragon Car Services Hull on Anlaby Road even today, although I doubt many Morris Sixes frequent their workshops nowadays.